Over the years, a number of myths have evolved about logs and sawmilling. Many have their basis in the experiences of sawyers, while others are just flat out wrong. Here are my observations about some of these myths. What species? How do you intend to use the wood? Let’s look at these one at a time. Most of the problems with wood warping is due to the fact that it shrinks about twice as much tangentially to the growth rings as it does radially. That means quarter sawn wood shrinks half as much in width as flat-sawn wood, but twice as much in thickness. Quarter sawn wood is also less prone to cupping. On the other hand, if properly kiln dried, even flat-sawn wood will have very little shrinking, swelling, or cupping in most indoor environments. One of the best reasons for specifying quarter sawn wood is for its appearance. The ray flecks in oak and sycamore can be spectacular. In other species, it is less noticeable, but the parallel grain is still attractive. Finally, quarter sawn wood is highly prized for its acoustical properties for soundboards of musical instruments. If you have such a niche market, quarter sawing lumber can be a lucrative practice. Actually, blade lubricant is a misnomer. The fact is, freshly cut logs are half water (or more), by weight. Dripping a little water on the blade won’t hurt anything, but with all that water already in the log, dripping on a little more will have little, if any, benefit. On the other hand, if you experience pitch build-up on the blade, adding some detergent or cleaner such as Simple Green or Pine-sol to the lubricant keeps the blade clean. Some mill manufacturers recommend Diesel fuel as lubricant. While it does help keep the blade clean and rust-free, Diesel fuel can be very hard on belts—literally dissolving them. It doesn’t take much Diesel– typically, a rate of about one drop per second is adequet. If you are looking at mass-produced products, such as pallets, this is probably true. Big mills make very little money per pallet, but produce them by the thousands. They have large investment in equipment, and hire enough labor to keep everything running full-time. Railroad ties and flooring have similar economics. On the other hand, if you can establish a niche market with woodworkers, custom cutting, and milling special wood, such as urban lumber, you may find that even a one or two person operation with a small band saw mill can do quite well. The trick is to provide a product or service that is unavailable from the big mills. 4) More power is always better. This is true up to a point. For most mills, the largest power option will give the best cutting speeds and be more productive. But when selecting a mill, consider the compromise between cost and power. Many mills run profitably on 20 to 25 hp. While these are not high production mills, they mill for niche markets, while keeping the cost down. If it is a question between paying cash for a small mill or going into debt for a larger one, carefully consider your business plan and what you can realistically expect to mill. If your sawmill is to be mobile, you should consider the size of the truck required to tow it. Also, larger mills require more support equipment which either sits idle while you are milling, or need an employee to run it. Many sawmill operations started out small and built up as the business became established. Mills with hydraulic options have an advantage, since they allow expansion as finances allow without replacing the sawmill itself. The actual moisture content of wood is the same year ‘round. What does change is the amount of sap in the wood. Many species—especially softwoods—have more sap in the spring when they are coming out of dormancy. Winter may be the best time for logging and skidding if the ground conditions are better, and it causes less damage to the remaining trees, as well. Dead trees loose very little moisture when they are standing dead. Even after several years, the moisture content is as high as it is in a living tree. Waste is generally a by-product for which no practical use has been found. Slabs may be firewood or even used for slab furniture that can bring a good income. Sawdust can go for mulch, animal bedding, or to clean up oil spills. Wood pellets is another potential use for the sawdust. 8) If air dried long enough, lumber is as good as kiln dry. No matter how long you air dry wood, it will not reach the same moisture content as kiln dry wood (unless you live in an arid part of the world). Air dry wood reaches a moisture content governed by the average relative humidity. Typical moisture content of air dry wood is around 12% to 14%. Kiln dry is 7% to 8%. Add to this the fact that temperatures in the kiln typically kill any insects in the wood, and you have a good case for kiln drying. It is possible to use air dry wood for many applications, especially outdoor use. 9) Less common tree species are worth less. Less common species may be worth less to big sawmills that need to put out a uniform product, but to small custom mills, the same sycamore log that a big mill might put on the reject pile can bring twice as much as a clear red oak log, if you find the right buyer. 10) Trees from yards and urban areas are not worth milling. 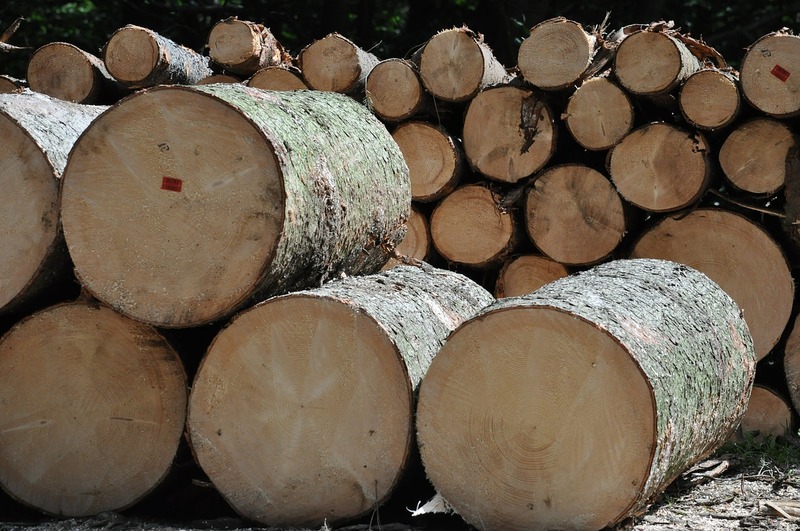 Urban logs have several attributes that make them undesirable to commercial mills. First, they are scattered, and it may not be feasible to send a logging truck on a fifteen-mile trip for just one or two logs. Second, they are often poor form, with low branches. Finally, they are notorious for embedded metal that can destroy a $1,200 saw blade and pose a safety hazard. While all this is true, there are a number of small sawmills that specialize in urban logs. They are often available at no charge, since they would otherwise go to the landfill. It is also a good way to get a variety of species that have been planted and are not available in local forests. As for metal, consider this: a band saw blade costs around $15.00 to replace, but one good slab may sell for $150.00. The risk is worth taking, especially since it does not pose a safety risk if you do hit metal. The wood is typically harder, but with a properly sharpened blade and good technique, hardwoods may be easier to mill, since the fibers tend to cut cleanly. There are some species, including spruce and pecan that have a well-deserved reputation of being difficult to cut, and a log with large knots takes special care, but with experience, they pose no problem. Actually, sharpening your own blades can result in faster, straighter cuts. For one thing, you will be more likely to change the blade as soon as it shows signs of becoming dull, since there is always a sharp one on hand ready to go. Also, when you sharpen the blade yourself, you will be more likely to pay careful attention to details like the set of the teeth and any cracks in the blade. This may be true for big mills mass producing a given product like flooring, but “character” wood is far more valuable to custom woodworkers, and they will pay a premium for wood that is as unique as their creations. This one is true. Large limbs, especially of valuable species like walnut, make tempting saw logs, but the tension in them makes them twist and bow, even while being cut. It gets worse during the drying process—and by then you have all the time and expense of milling and stacking. There are a couple of exceptions. Short pieces that can be used as plaques or cutting boards may be usable, and cross sections, or “cookies” are very popular at weddings as platters. 14) Anything shorter than 8’ isn’t a log. Woodworkers typically use shorter pieces. If you can adapt your mill to cut logs as short as 3’ long (or even shorter), you will find a use for wood that would otherwise have gone for firewood, and possibly get a good price for it—but remember, it does take more handling and board feet per hour production will be low, so charge accordingly. Even shorter logs may go for turning blanks. I have to admit that I am a little shocked that diesel fuel can be used as a lubricant when cutting up logs. Isn’t it bad for the wood as well as the belt? I guess not, since it is still being used, but it still shocks me. Anyway, thanks for all of the information you have posted. It is really helpful. Diesel will stain some wood. Just use some laundry detergent.